This B&H Kit combines two Seagate 3TB IronWolf 5900 rpm SATA III 3.5" Internal NAS HDD together for a total storage capacity of 6TB. These two drives can serve a variety of functions. Install one or both in your host system, RAID, or NAS array, or keep them handy in case existing drives need to be replaced. 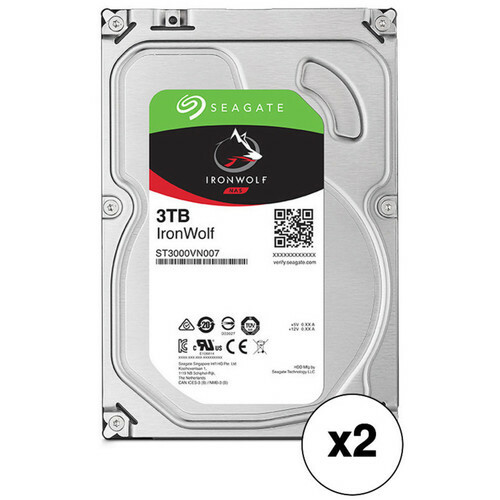 Designed for use in 1-8 bay NAS environments within home, SOHO, and SMB environments, the 3TB IronWolf 5900 rpm SATA III 3.5" Internal NAS HDD from Seagate is built to withstand 24x7 operations, or 8760 hours per year. This 3TB drive has been equipped with a SATA III 6 Gb/s interface, a rotational speed of 5900 rpm, a 3.5" form factor, and a 64MB cache, providing users with an ample storage capacity and data transfer speeds of up to 180 MB/s. This IronWolf hard drive also has an MTBF rating of 1 million hours, 600,000 load/unload cycles, 1 in 1014 non-recoverable read errors per bits read, and a workload rate of up to 180TB per year. Protection is provided by a limited 3-year warranty.